SAN MARCO Catering - Washington, D.C. If you love good and authentic Italian food, served Italian style in a restaurant that looks and feels like Venice, San Marco is the place for you. The prices are affordable, the food is home made, and everything is fresh and delicious. The atmosphere makes for an intimate, friendly, and thoroughly enjoyable evening. Roberto Massarin and Pino Mele, the co-owners for over 15 years, take great pride in making this a restaurant where customers are treated well, feel comfortable and get a true taste of Italy. This explains why most evenings you find many regular customers who come back over and over again. 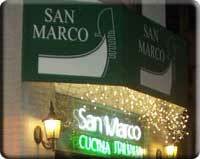 "San Marco is quiet and easygoing, an extremely pleasant neighborhood restaurant. It's just the kind Washington might have by the dozen if we had Italian neighborhoods here." The menu's antipasti include carpaccio drizzled with virgin olive oil and shavings of Parmesan, and tomato and mozzarella salad garnished with fresh basil. Try one of San Marco's four risottos (each $9.50), and you'll have enough creamy rice for lunch the next day. (The kitchen recommends the risotto with saffron and shrimp.) Pastas cost less than $10, veal and fish between $10 and $15 and desserts, including tiramisu and tartuffo, add $4-$5 to your bill. 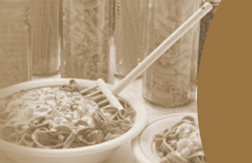 Everyday there are specials which reflect a terrific variety of pasta, fish, meat and rice dishes. There is something for everyone - as long as your taste runs to truly Italian dishes. San Marco is equally well known for their fantastic monthly wine tasting dinners with a excellent variety of wines and a five-course gourmet special meal. At $42.50 per person, these evenings sell out quickly, so make your reservations soon. To receive regular email announcements of these events, sign up for the mailing list.